Gangotri, Yamunotri, Badrinath, and Kedarnath has been long worshipped by the devoted Hindu, and their landscapes do resemble to any of the beautifully illustrated religious tales. 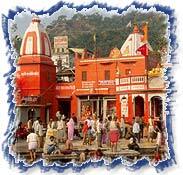 Besides this, our tour takes care of other important pilgrimages en route, namely Haridwar, Joshimath etc. This tour package has been created keeping in mind the distinct choices of the pilgrims and the people inclined towards spirituality so that they can achieve the maximum from their pilgrimage tour. Arrive Delhi and transfer to Haridwar by Road / Train ( as per your preference ). On arrival in Haridwar, Check into Hotel. Evening free or visit Har-ki-Puri. Overnight at Hotel. Depart from Haridwar early morning and take lunch on the way in Mussoorie. Restart your journey and reach Barkot in the evening after visiting Kempty Falls on the way. On arrival check in The Chradham Camp Yamunotri, just 1 km out of Barkot town on the Yamunotri Road. Overnight at Camp resort. Again after an early breakfast leave for Hanuman Chatti ( Drive 32 "Kms" ) to start your journey. Take a local jeep to reach phool chatti to shorten your trek by 5 Kms". On arrival start your day on a tough trek of 7 Kms one side. 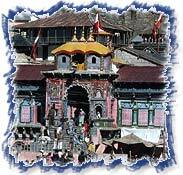 Arrive at Yamunotri and pray at temple and also take a holy Achman to start your most sacred pilgrimage to Char Dhams. Come back to phool chatti in the evening to return back to camp resort for dinner and relaxation with Ayurvedic Massage at the resort. Overnight at camp resort. After a relaxed breakfast leave for Harsil a drive of 152 "Kms". En route stop at Uttarkashi for Lunch. On the way stop at Gangnani for hot water spring dip. Restart to reach Harsil, one of the most beautiful valleys in the world and reach The Char Dham camp set amidst an apple orchard in Dharali village 2 "Kms' away from Harsil cantonment in the valley on the highway itself. On arrival check in for dinner and overnight. Evening Ganga Aarti at camp is a regular affair. After breakfast leave for Gangotri and on arrival take a holy dip in the River sacred The Ganges, also called Bhagirathi at its origin. Perform Pooja after that and relax for sometime in the lovely surroundings. Come back to camp resort in the afternoon to relax in the bright sunshine and some of breathtaking views of the valley beautiful. In the evening perform the Ganga Aarti at resorts own river bank. Dinner and overnight at camp. After a very early breakfast leave for the longest journey of the trip on the road. Late Lunch en route at Srinagar. On the way see the heritage city of Tehri going down in to the mighty waters of Holy River Ganges, because of the construction of Tehri Dam. 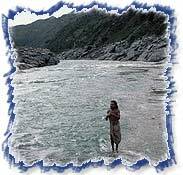 After lunch restart your journey and today for the first time see the river beautiful MANDAKINI. Travel along this to reach Guptkashi late in the evening. On arrival check in The Char Dham camp ( Guptkashi ) located 2 kms' out of town towards Gaurikund. Dinner and overnight at hotel. After breakfast pick up your packed lunch and leave for Gaurikund ( a 32 "Kms" drive one way) on arrival start your journey on the tough trek ahead. Stop for the lunch en route and restart after that to arrive by late afternoon. On arrival check in Tent / Ashram. After freshening up perform pooja and also Darshan at the shri Kedarnath ji. In the evening also visit Adi Shankaracharya samadhi at the back of the temple. Dinner and overnight at Ashram. After breakfast start you journey back to Gaurikund and on arrival leave for Guptkashi by road to reach the Char Dham camp by evening. Relax with Ayurvedic Massage. Dinner and overnight at resort. After breakfast leave for Joshimath via chopta, one of the most beautiful sites on the whole trip. Enjoy the beautiful drive through the thick medicinal forest and stop at pipalkoti for Lunch. Arrive at The Char Dham Camp Joshimath by late afternoon. Evening free in Joshimath. Dinner and overnight at resort. After breakfast leave for Shri Badrinathji, on arrival take the holy Darshan and spend time visiting Mana village the last village before the Tibet border. Come back to Hotel / Tent for dinner and overnight. After breakfast leave for Haridwar and on the way take lunch at Srinagar. Restart and if time permits visit Devprayag ( The confluence of rivers Alaknanda and Bhagirathi, to become Ganga ). Reach Haridwar in the evening and check in at Hotel. After breakfast leave for Delhi. Tour Ends on arrival in Delhi.